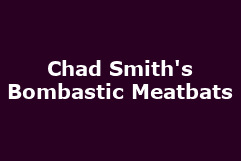 Red Hot Chili's Chad Smith releases the Bombastic Meatbats in October 2009! Red Hot Chili Peppers drummer Chad Smith releases new band 'Chad Smith's Bombastic Meatbats' debut album next month. Featuring Chad Smith on drums, Glenn Hughes collaborators Jeff Kollman and Ed Roth on guitars and keyboards respectively and Ted Nugent man Kevin Chown on bass, the Bombastic Meatbats are a pretty damn funky rock instrumental band. Chad was recently over in the UK with super-group Chickenfoot for a sold-out Shepherds Bush Empire gig in June, featuring cohorts Sammy Hagar (ex-Van Halen and Montrose), bassist Michael "Mikey" Anthony (also ex-Van Halen) and guitar supremo Joe Satriani. With the afore-mentioned Chickenfoot featuring Chad, the recently announced Them Crooked Vultures, featuring Josh Homme (QotSA), Dave Grohl (Foo Fighters) and Led Zeppelin's John Paul Jones, and the White Stripes' Jack White forming The Dead Weather earlier in the year with members from The Kills, QotSA and The Raconteurs, it's fair to say that 2009 has proven to be quite a year for supergroups. 'Meet the Meatbats' is released on 12th October on earMUSIC records.